‘Jazz Drum Explosion’ catches .. The Harpeth Wetland Bank recently donated about 220 acres of rural property in the Rockvale community of Rutherford County to MTSU. 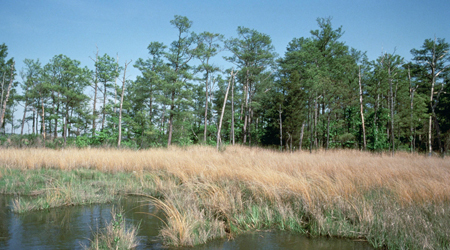 Donated acreage, similar to the wetlands depicted in this file photo, will provide a unique "outdoor classroom" for student research at MTSU. The land, previously known as the Puckett Farm, was donated with the support and encouragement of the property’s previous owners, former MTSU employee Betty Rowland and her sisters, Mary Taylor and Ann Hartmann, in honor of their father, Clarence William Puckett. Mr. Puckett was a member of the Middle Tennessee State Teachers’ College Class of 1941. It will be used as an environmental field laboratory for programs in biology, environmental science, botany, conservation and other sciences. Vice President of Development and University Relations Joe Bales said the gift will give undergraduate and graduate students alike easy access to a unique outdoor classroom. Bales added that there may be opportunities for some recreational use of the property, which is located about a 20-minute drive from the MTSU campus. Established as a wetlands mitigation site in 1998, the acreage has since been restored to offset unavoidable wetland losses. The site has been revegetated and reforested to complement the many native plants that have been catalogued on the property.